The village of Arlington, an approximately one-square mile neighborhood in the Town of Poughkeepsie, was originally called Bull’s Head, after a local tavern dating from the Revolutionary War era. When Vassar opened in 1865 on the grounds that had formerly been the Dutchess County Club Horse Race Course, a variety of small shops that served the needs of the college community opened in Bull’s Head. Many of these stores were constructed from existing small-frame houses. In 1872, Bull’s Head was renamed East Poughkeepsie, in an effort to make the village sound more dignified. However, this designation did not last long; in 1900, the area became known as Arlington, possibly after Arlington Cemetery, although the origins of the name are uncertain. When Henry Noble MacCracken became President of Vassar in 1915, he recognized a need for greater cooperation between Vassar and Arlington, and he spearheaded a movement to increase the college’s involvement in the community. At that time, Vassar was largely self-reliant for food, electricity, and many of its other needs, and those which could not be met by on-campus production were seldom bought from local merchants. MacCracken instituted a policy of buying locally, whenever possible, and by 1940, Vassar spent several hundred thousand dollars a year on goods and services from local suppliers. In September 1924, in cooperation with Poughkeepsie banker Peter Troy, MacCracken established the Vassar Bank on Raymond Avenue, so that the college would no longer have to serve as a bank for its students. MacCracken also believed that the college should teach its students how to be community activists by striving for better schools, roads, and health care in Arlington and Poughkeepsie. To that end, a student group called the Township Committee was organized to increase involvement in local affairs and “creat[e] a more real community spirit” between the college and the community. The Juliet Theater opened on the corner of Collegeview and Raymond Avenues in January 1938, quickly becoming a popular destination for entertainment in Arlington. Around the same time, several small businesses were established along Collegeview Avenue, followed by the a branch of the stylish Peck and Peck clothing stores on Raymond in the 1940s, beginning an era of relative economic prosperity for Arlington. 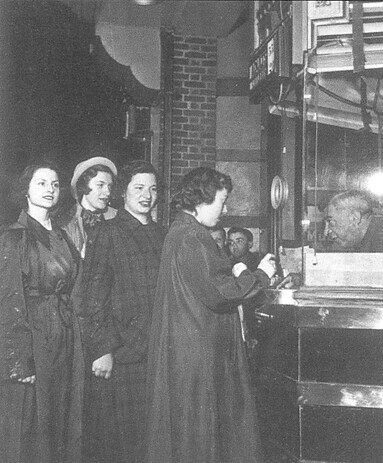 Many of the new establishments, particularly the College Drug Store, were frequented by Vassar students. However, in the 1970s, when students gained the right to keep cars on campus and the South Hills Mall opened its doors, Arlington businesses experienced a considerable drop in sales, which only worsened with the advent of the Galleria Mall in the mid-1980s. Meanwhile, as offerings in the college bookstore expanded and dining facilities’ hours lengthened, students felt an increasingly slimmer need to shop in Arlington. An Arlington Business Council had been established by 1980 to revitalize local commerce, but Vassar was not as yet involved. However, in 1999, Vassar funded an intensive study of the conditions and needs of the Arlington area, which was conducted by the Project for Public Spaces, a New York City-based non-profit consultation group. At the same time, Vassar purchased several properties in the Arlington area in order to head the effort to remodel buildings and revive commerce. Vassar has since worked with community leaders to create a community garden and art space on Raymond Avenue and to institute an annual street fair to promote local businesses, as well as sponsoring a weekly Farmer’s Market on the lawn of the Alumnae House. A new organization called the Arlington Business Improvement District, consisting of local political, educational, and business leaders as well as representatives from the Vassar administration, was established in 2002. Briggs, Harry T. Notes on Horses and Trotting Races. Unpublished manuscript, 1955. Local History Room, Adriance Library, Poughkeepsie, New York. Daniels, Elizabeth A. Bridges to the World: Henry Noble MacCracken and Vassar College. Clinton Corners, NY: College Avenue Press, 1994. MacCracken, Henry Noble. The Hickory Limb. New York: Charles Scribner’s Sons, 1950. Marcus, Eric. “The Real Estate Developer of Last Resort: Vassar College and the Village of Arlington,” Master’s thesis, Columbia University, October 2003.